"The greatest thing to come out of Barnsley, since the A61 to Sheffield"
​"The Bar-Steward Sons of Val Doonican are very, very funny...one of the hardest working bands on the planet"
Put on yer finest knitted gladrags, style your barnet, put on your dancing shoes and bring your finest singing voices, as we cordially invite you to witness the Greatest Show On Earth (in tank-tops). Hailing from Barnsley Rock City in t'North, The Bar-Steward Sons of Val Doonican are on a mission! Determined to follow in their spiritual father’s immortal footsteps and keep his legacy alive, they have a talent for Bar-Stewardizing other famous people’s songs with new comedy lyrics, on acoustic geetar, ukulele, banjo, fiddle, mandolin, accordion and keyboard. To complete their squeaky-clean image, brothers-from-other-mothers Scott, Björn and Alan have become instantly recognisable for their immaculate hair and their stylish choice of knitwear. A band that is both perpetually on the move and joyously independent, since forming in 2006, they have played over 900 side-splitting shows to date, and have brought smiles and belly-laughs to audiences across the UK; from Barnsley to Barnstaple, from Glasgow to Glastonbury. They continue to wow audiences with a fine selection of their greatest hits, including the likes of “Jump Ararnd”, “The Lady In Greggs”, "How Deep Is Your Glove? ", "Nandos", “Paint 'em Back", "Walking In Manpiss" and “If I Could Punch A Face… It’d Be Justin Bieber’s”. 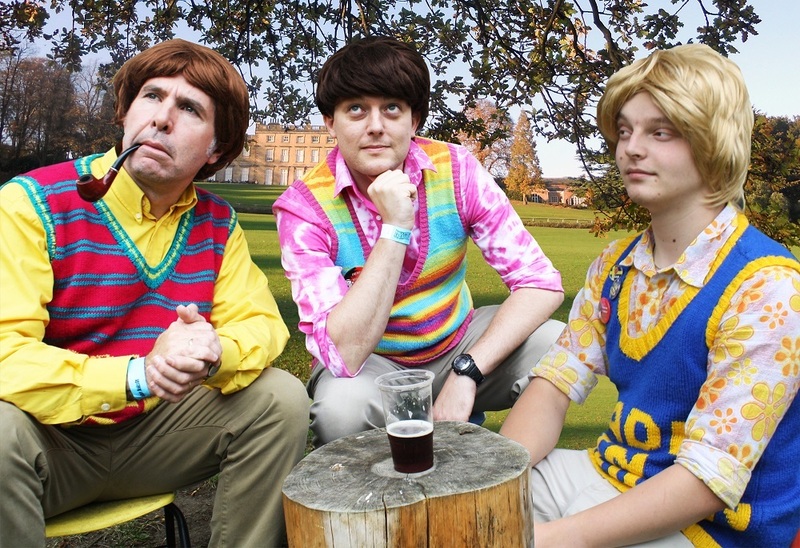 The Bar-Steward Sons of Val Doonican can't wait to bring their shindig to Canterbury and they promise that they WILL Rock you...but gently! "One of the hardest working bands around, great entertainers, and the best pastiche outfit I know of." "A ridiculous family of genius, hilarious, irresistible music makers, currently crowd-surfing to the bar all over the great county of Yorkshire and beyond, into the venues and music festivals of the UK. They're quality." "Loved The Bar-Steward Sons of Val Doonican. Great fun"
These fellas were relatively unknown when they bounded on to the Cropredy stage last August. An hour later they had approximately 17000 new best friends. Our programme/ nay East Kent would be sadly lacking if we didn't bring them to Folk in the Barn. They were THE hit of Cropredy 2018 and I really can't wait to see them again.